Sleeper is another basic tool by TheFreeWindows that will perform the simple task of putting your desktop monitor or laptop screen into its low power state by shutting it off. Sleeper is almost identical to Turn Off LCD above apart from being a bit larger file size (790KB) and you simply double click the executable to turn the screen off. TheFreeWindows also have another program called NumPad Transformer which adds several shortcuts to your NumPad keys, one of which is the option to put the screen to sleep. This does actually use the Sleeper standalone utility to do it. Monitor Off is along the same lines as Sleeper and you simply double click the executable to turn off the display. The program is a tiny 40KB file and it will also honor the security settings so if you usually resume from a screensaver or standby to the lock screen, that will also happen after turning the screen on after using Monitor Off. The way BlackTop works is again very simple any easy, and it will sit in the system tray waiting for you to need to put the screen into a low power state. Then all you have to do is press the program hotkey combination of Ctrl+Alt+B and it will immediately put the screen to sleep. Press ant key or move the mouse/touchpad to bring the screen back to life. 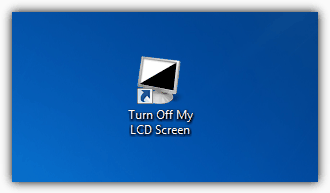 Another tool that is able to turn off your LCD screen and much more besides is by NirSoft. NirCmd is really a little Swiss army knife utility In addition to turning off the display, it can also perform other tasks such as ejecting optical drives, altering the system volume, a number of window and process related functions, clipboard functions and also log off, standby and screensaver options. NirCmd is a command line only utility and requires you to create a shortcut which you can then add the command to switch the display off. 1. Download the tool and extract the zip file. 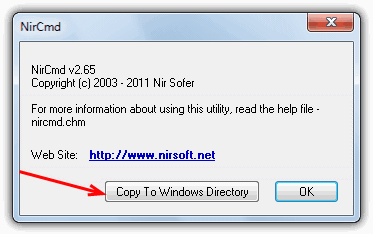 Copy it to the location of your choice, or double click the NirCmd.exe and there is a button you can click which will copy it to C:\Windows for you (Vista and 7 users will need to right click and “Run as Administrator” if you’re not the Administrator). 2. Right click on your Desktop -> New -> Shortcut. 3. Click the button to browse and locate the NirCmd.exe and press OK. If you let it copy itself over to the Windows folder, just enter nircmd.exe into the box. 4. After nircmd.exe in the text box, enter ” monitor off” (including space but without quotes). 5. Give the shortcut a name such as Turn Off My LCD Screen. Click Finish. You can right click the new shortcut -> Properties -> Change Icon to find a more appropriate icon. Obviously, you can use any of NirCmd’s other functions by following the same procedure to create a shortcut. We also use the NirCmd tool to turn off the display using a keyboard hotkey, and it works well. Check out the website for a complete list of other functions. There is another little utility along the same lines as NirCmd which can turn off the display that we have used in the past called Wizmo. It’s not been updated for several years and we’ve never used it on Vista or 7, but there’s no reason why it wouldn’t work. It does have a few functions NirCmd doesn’t so is worth a look. #1 works for me on HP Envy dv7. Keep it in downloads folder, drag to start bar to make a quick shortcut. Which of the 7 listed would be best for use on a Toshiba Satellite laptop? How can I turn my screen off in a way that it stays off while I wirte on the keyboard? The text I write should be saved. I love to write on a black screen, it makes my mind more free and it’s more relaxing to my eyes. With my old medion laptop I had the hotkey “fn + f11”, now on my new Thinkpad I miss this function a lot! I only found software that turns the screen off, but it resumes after pressing any key. I need a software that resumes the screen only after pressing the hotkey. In actual fact, that doesn’t really help much because with a blank screensaver the LCD screen is still “on” and using energy with the backlighting etc. There’s a lot of articles on the web which say in most cases black pixels are no better at saving energy than white/coloured pixels. I desperately need some way of turning off the backlight on the screen with some kind of hot key but not putting it to sleep nor waking it up with mouse or keyboard activity. I wish to retrofit a Pixel Qi sunlight readable screen on a netbook (Toshiba NB550D) which will activate when the backlight is completely off. That way I can use it in the sunlight while the screen works in a reflective mode thus conserving battery life per charge. But I need to work on Word docs so needI DON’t want the mouse and keyboard to turn the screen backlight back on. Could you or someone please walk me through the steps of how to install/use this script or any program to set up a hotkey for turning off the backlight and also one for turning on the backlight again. Other computers such as Samsung and Lenovo have Fn+F5 etc.to do this. Thanks heaps if you can help me with this anyone. Windows + P will give you an option for Projector only which cuts the signal to your built in display and causes it to go to power saving sleep mode. I use this method to get old Laptops working for the elderly so they can still access the power button but only use a large external monitor combined with a ‘real’ keyboard and mouse. Thank you, brother!!! awesome stuff! just what i was looking for! works perfect with HP Pavilion G7. I have a hp Pavilion too works great! Its great. Thanks buddy. Works properly on Dell Inspiron machines! It’s exactly what I wanted for a Dell Vostro 1015, thank you very much. It works perfect. This program, actually turns off the back light which is more useful than turning off the LCD. Just what i needed, 1st application works perfect on Hp Probook 4530s (Win7 x64). Thanks. This is awesome. Thanks for posting! Thanks SO MUCH! I’ve got a Sony Vaio VGN-BX740 with programmable S keys. This is perfect! Works Great on My MSI GX 660 R, Specially when you want to clean the display. just what i needed, works perfectly, thank you! Awesome! Worked like a charm on my HP laptop. Very easy to install and easy to operate…just double click the icon. I have my laptop on my coffee table right in front of the TV and the screen is a huge distraction. When I play video games I like to have some light music on and the screen will distract every time…until now! I can’t believe the makers of these machines don’t include an easier way to do this. Mr. Asad thank you for this very essential piece of programing. I hope to see more of your talent in the future. I’ve pinned this to my taskbar (drag n drop) on windows 7. 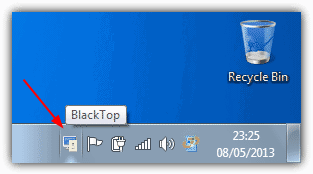 Just 1 click on the taskbar icon… easy!!! Thanks for this.. <3 from Vostro V13. Thanks buddy. Was looking for such a shortcut for long. Thanks a lot. Thanks a lot.. Works perfectly.. Dell Studio 1558.. SO COOL! Just what I was looking for! Thank you mate, I am looking for a long time for such an app. I am using HP6820s, and it works great. Awesome. Just what I was looking for. Thanks. Great! Work on my Dell Latitude D620. Thanks a lot. Brilliant Redmond! I recently built a desktop with an ASUS M4A89GTD Pro/USB3 Motherboard. The Windows 7 Ultimate Power settings worked at first then stopped working to shut the monitor off after a set time. I was searching your Blog Site for a remedy. Came across your tiny TurnOffLCD program. After placing a shortcut from Program Files in the Win7 taskbar it works better and is more useful that the Power Timer in Windows7. It is important to conserve energy and this applies to not just Laptops. I have been a subscriber to RaymondCC for years and am constantly learning from your wealth of knowledge. Thank you for your efforts and the valuable information you provide. This is my first post here after all these years. Thank you so much for pointing out this app. It works perfectly with my LG CRT monitor. App runs fine on my Dell Studio 1555/Windows 7. Put the exe in a folder and right click it, send to desktop as a shortcut which you drag to the task bar. Delete the desktop shortcut and the little icon looks like part of the OS. so great…. thanks…. 100 useful!! Its a great application.simple to use.Thanks a lot. Turn off screen by closing lid is not a better option as suggested by many because it is heating up touch pad area and more over we can’t hear the songs when lid is closed as speaker is inside. yours application is very useful. Thanks Raymond for this find! Thanks man, Ive been looking around all day how to do this. I download a lot of stuff that takes a lot of time. I wanted to figure out how to turn off my screen so it wouldn’t burn out because I heard laptop LCD Screens aren’t as durable as Desktop LCD Monitors. They are pretty frail from what I here. Works great on my Vostro 1500 (Vista)! Thanks a lot; it’s just what I was looking for! thanks for this wonderful program..
Works also with CRT monitors to save power! Nice one! Nice tool – Good to have. Thanks, this is an awesome tool – I’ve been looking for something like this for a while and it’s just what I needed! Thanks a lot. it works like a charm. you are great Raymond i was just wondering how to do that because yesterday i connected my HP laptop to BenQ external LCD 19 inch which is bigger than laptop’s monitor and i wanted to turn off my laptop LCD but i could not..
Niche, I usually leave some download work going on in the background when I go off to sleep, however it is the dim light from the laptop LCD is annoying. Using it will solve that one. Thanks for sharing a cool trick.